I am very excited about this recipe. It opens up so many possibilities. I was flicking through Charmaine Solomon’s Family Album which, I must say, is not a particularly inspiring cookbook, and spotted these oat bran muffins. As I mentioned in my ‘In My Kitchen’ post, I was attracted to the recipe because I have had some oat bran in the cool room for ages and had no idea why I bought it or what to do with it. I was also interested in the fact that, in order to achieve finely textured muffins, Charmaine suggested grinding the oat bran in a blender until it is fine. If you do a Google search for oat bran muffins, you won’t see many finely textured muffins on display – they all look very textured and good for you. I liked the idea of finely textured ones :). Charmaine also notes that the muffins are non-dairy and low cholesterol. Well, they would be low in cholesterol if I had stuck with the recipe and only used the egg whites. Maus’ and my cholesterol are fine and I didn’t want left over egg yolks (they don’t freeze well) so I used two eggs. Of course, if you have high cholesterol, you may want to try the recipe using egg whites. Apart from using whole eggs rather than just the whites, the first time I made these muffins I adhered to the recipe. They were nice but a little too orangey for my liking. That is when I got the idea of replacing the currants with chocolate chips. 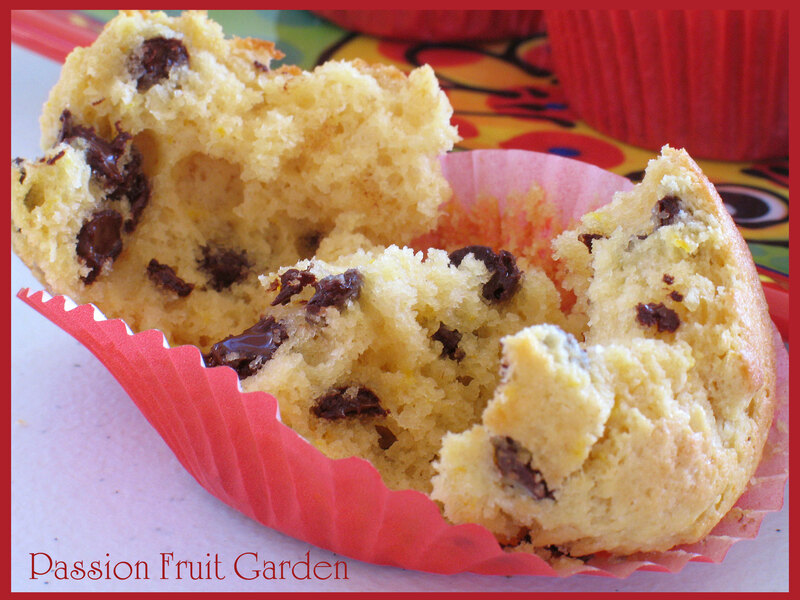 Chocolate goes exceedingly well with orange and adds richness to an otherwise lean little muffin. They are, indeed, finely textured with a lovely open crumb. I included this photo so you can see how light and fluffy they are inside. It is hard to believe there is a cup of oat bran in there. What a great way to enjoy a treat and increase your fibre intake at the same time. Charmaine also gave instructions about how to make these for breakfast. The night before, prepare the dry ingredients in one bowl and the wet ingredients in another bowl. Cover each bowl with plastic wrap and put the wet bowl in the fridge. The next morning, mix and bake. Put the oat bran in your blender and blend until the bran is very fine – much like flour. I have a Vitamix which did a great job of grinding it. Sift the self-raising flour, salt and baking powder into a bowl. Stir in the blended oat bran, sugar and choc chips until evenly distributed. Beat the eggs with a fork in another bowl. Stir in the grated zest, juice and oil. Prepare muffin trays (either brush with oil or use patty pans). Combine the liquid mixture with the dry ingredients and gently mix until the dry ingredients are just moistened. Bake for 15 minutes or until the muffins are cooked. 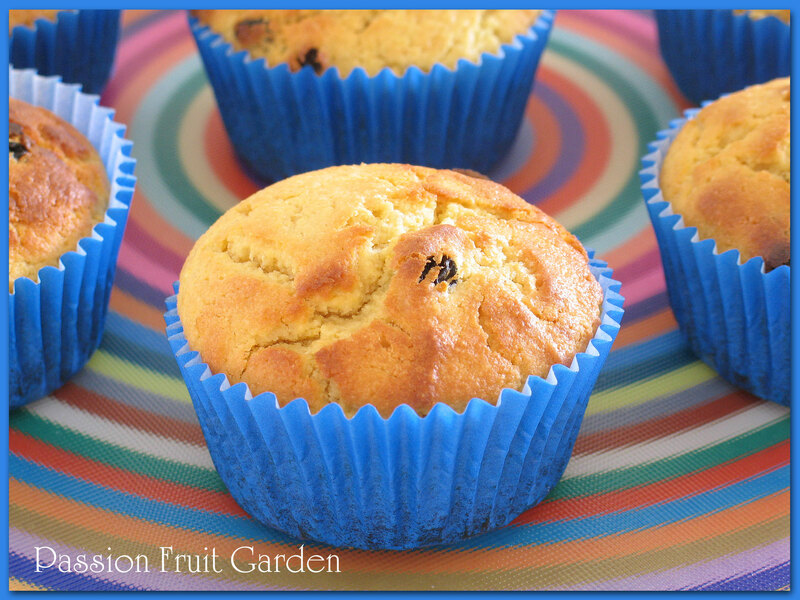 This entry was posted in Muffins and friands and tagged breakfast muffins, Charmaine Solomon, high fibre muffins, low cholesterol muffins, oat bran muffins by Glenda. Bookmark the permalink. Those look absolutely perfect Glenda and I do like the idea of the chocolate chips too. You really caught them at that perfect stage, just a little golden on top. Hi Diane. You are too kind. I do like the fact that that bran is good for me but I don’t know it is there. It is often the texture of “good for you food” that puts people off, so great idea to render the oat bran finer, sort of like hiding the veges in rissoles, spag bol sauce etc 🙂 I’m a fan of oat bran – having to reduce my cholesterol only a little, and avoid too much sugar, I find it a great base for my homemade muesli (+ nuts, seeds and coconut) which I eat with plain full fat yoghurt and a few frozen berries. The oat bran gives it a sweetish flavour. So yummy, and good for you too! I love your approach to recipes, Glenda.